I'll replace the breastamids of giza with trees. Everybody's happy. Only the face and hair textures are mine. You can still sort of see the seam where the upper face connects to the mouth, and the bottom of the nose's map also hasn't been tied in properly to the mouth graphic either. The distortion on the bottom of the chin/neck is an artifact of the original UV map - I haven't corrected yet. When I say the original skin was way yellow, I mean that weird yellow texture on the hand you can see. 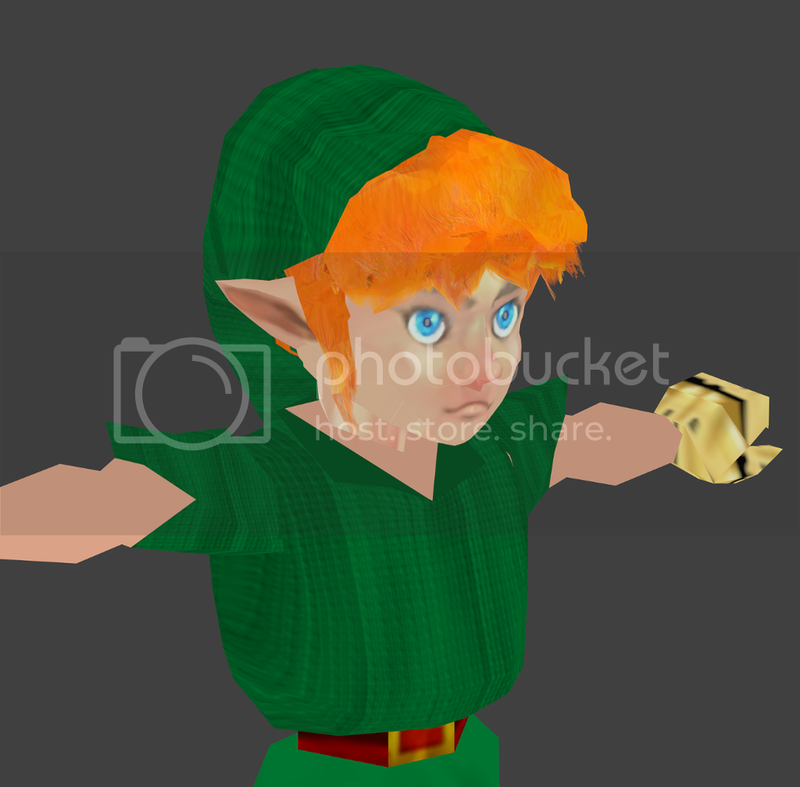 I'm actually still trying to skew towards yellow while keeping it less jaundiced and more natural/humanistic looking, not unlike the coloring changes in OoT3D, which you can see in the shading highlights of the face. The original palette isn't just weird, a lot of colors clearly had to accommodate some of those decisions, probably as an afterthought I'd guess. Link's colors and many others were probably chosen to suit the Kokiri Forest environment, and I think that had a big knock-on effect in all of the environments and characters they designed afterwards. And yeah, I'm pretty attached to Link with the orange hair. I was born as a redhead so it's always been an important thing to me to see that in a primary hero character. That is some awesome detail work there, AI. How extensively/completely do you plan on going with this modding? I'm going to say that I should be able to completely retexture the base game with no problem, time commitments aside. The more complicated the modding, the less certain I am that I can get it to function properly, but the more interested I am in making it work. For example, the actors in a scene are actually capped based on how many polygons are present. I can hack the game to increase the limit, or possibly remove it (but increasing would be just dandy and probably not cause crashes) but that may cause issues with some emulators or may not be enough to extensively remodel/add to the environments. If I find it goes smoothly enough or I like the challenge, I can and may go on building the areas into something much more complete and alive. Depending on how much I keep modding, I've considered starting a patreon for interested parties to make sure I have incentive to keep at it, as I also have done work on other incomplete mods, etc, and even started messing with 4k texture assets and sprites for Doom, since the community HD for that is in a similar state. I feel like I have enough experience and get competent results quickly enough to the extent that I could do this professionally, but I honestly like modding for an appreciative community more than I like the idea of working on an unknown quantity. I've actually considered porting the assets to a new engine and building it there instead, but I think that is probably far enough afield that I may as well just build my own game if I were to do so, and in that case I'd probably end up making something a bit different (I actually did legwork for a "Legendary" game engine a few years back <read: the Zelda parody concept I did some pictures based on>). One of the more extreme ideas I've had for changing OoT has to do with the rather limited camera and control systems, in that I like the targeting but would rather it be less ostentations/obtrusive and I think would still work well if I could actually separate the camera from the lock-on so then the player still has precise, lock-on targeting for combat but can leave the camera pointing where they want and so on. A test hack I did earlier with Twilight Princess where I repositioned the camera into a Diablo-esque top-down position actually left the game fully playable for the most part, with the notable exception being that the featureless ground of TP's field provided no landmarks with which a player could get their bearings. Kind of made me think a lot about the whole quality-per-frame issue where there's such dense visual information in a top-down Zelda like LttP where pathing on its own is somewhat entertaining, whereas in TP it feels more like a chore. Overall, I'd just like the game to hearken a bit more to the Terada-style scenes and other concepts that colored my earliest enthusiasm for Hyrule and Zelda. More emphasis on places and a sense of history being the primary facet of that. BTW, that reminds me, have you ever played Myst? I know you've mentioned your fondness for interesting/out of the way spots in Zelda, and that game is really heavy with similar feelings and ambience IMO. - New ultra-high detail graphics for textures and surfaces, to the extent that unless future N64 emulators support normal or distortion maps there should be no need to ever make higher-detail textures again. - New UI elements with a more unified, understated and stylized appearance inspired by original Zelda logo and text, probably in white. - New sounds. If I can hack them in, I could actually write real-instrument loops and such. I am a more than competent composer in my opinion, and multi-instrumentalist, so it's not really far-fetched. Sound production tends to be a huge timesink, though. Ideally however, I'd also add in the missing environment sounds that one might expect, such as the occasional bird chatter in the forest or crickets or frogs, etc. I would also like to potentially replace some things like dynamic music elements which play in combat with more ominous/aggressive sound design. - New and expanded areas. Hyrule in OoT is a bit claustrophobic, and it'd be nice to grow it a bit. Some of this might be a matter of actually adding more depth and dimension to Hyrule Field or actually adding in-between areas. A cave linking the Zoras' river to the field or a wooded space linking the Kokiri village to the field, so on. There's a lot of space to add in detail without it being obstructive. - Re-work camera controls/camera lock for targeting system. Likely any actual ROM alterations would be distributed separately with a patch, so if someone just wants the textures they can grab those. Any final product based on Ocarina should still require a proper legal copy of the core game. As long as it's your possession, you're free to alter it with whatever I release at your discretion. You should add guns to the game as ancient forbidden sealed Gerudo technology. This is fantastic. N64 graphics have aged so, so poorly. I was thinking the other day that, as great as the OoT and MM remakes look on the 3DS, I would have loved to see HD remakes like TP and WW got on the Wii U.
I honestly have 0 gripes with OoT and MM 3D except the bosses and zora swimming in MM. There was a lot of love put into those. The colors in MM specifically are phenomenal (I just recently picked it back up after a long hiatus, and since I used to play MM so damn much I remember all of the original game's colors and textures vividly. So it blew me away to see MM3D again because I am hyper aware of every single change, and visually they are absolutely all for the better. Game is lovely), but they also just did a lot of work fleshing out the worlds. MM turned the tree walls leading from Termina Field to Romani Ranch into actual modeled trees and foliage, the final portion of OoT in Ganon's Castle is stunning, the final boss rooms in both are BEAUTIFUL, care was taken to decorate homes and shops to make them look more alive..... I adore the N64 Zeldas and it's clear that the folks working on their 3DS remakes did as well. I can't wait to see AI's finished product, though. Distinctly a different visual style than the 3D remake and I'm loving all of the play-by-play updates. OoT3D's room updates were probably the best part, although I didn't like how they changed the tone of Castle Town so heavily. I can actually model real rooms for interiors if I get aggressive, although I might just settle for renders. The game actually has those 360 panoramas by breaking up a prerender into (what looks like) 64x32 textures drawn on quads arranged in a cylindrical shape. It's actually quite an expensive approach for the N64, in terms of texture storage, although it's obvious why they went that route when you consider what the normal poly interiors look like, although they're very incongruous when you see them outside the native resolution of 320x240. Incidentally, yeah, that's a really low res. The N64 actually went up to 640x480 with the RAM expansion pack, on games that supported it. 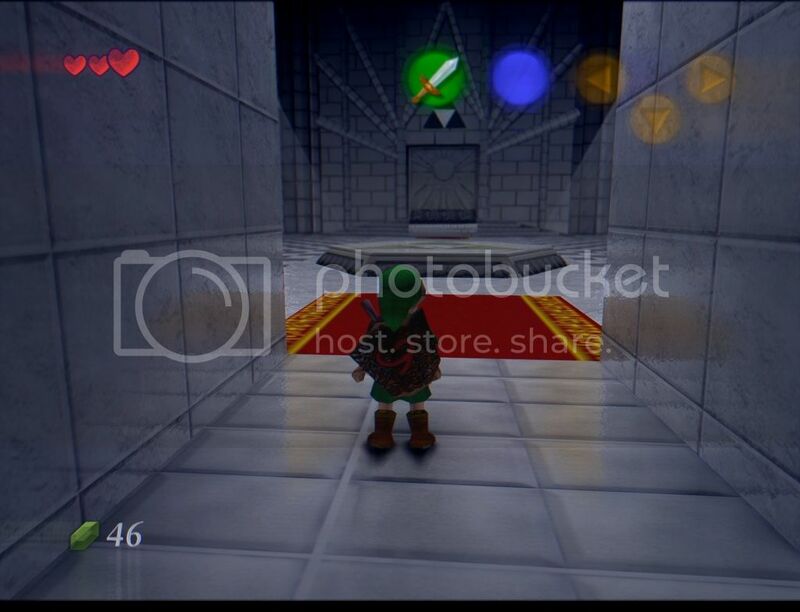 Random note about textures on the N64 and the Zelda 64 engine: The largest native resolution texture the system can handle with an undiminished palette is actually 64x32 pixels. 64x64 requires a palette of 16 colors or less, and anything larger [up to 128x128] can only contain a single 8-value channel. This explains why the paths in the vanilla game are actually stored with only alpha values masking the polygon's assigned fill color. There's actually a lot of wasted opportunity for optimisation here, because they could've used a smaller texture, but mirrored it. 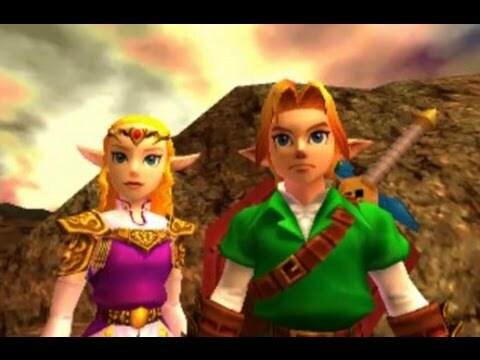 In some instances like the lack of mirrored texture for Link's eyes (it's 64x32) it makes sense, because it would use just as much texture memory to flip it in-engine, but the lack of depth in graphics like the path is noticeable. This kind of thing indicates that the game was kind of tied off in haste before development was finished properly, or rather that a lot was cut, which is basically already known but it's interesting to see the telltale signs. and Reflective Fresnel Mapping/Screenspace Reflections via colorspace. I've kept the fresnel reflections on the colors affecting Link's outfit, and some other hues, because it adds in a rough approximation of a light bounce, provided the reflections are blurred enough. The above shot is the only environment I've found so far where the tunic's reflections are actually showing that strongly, due to the brightness of the room and the close proximity of the walls. Proper normal mapping and light bounces would require native engine and renderer support, which obviously I'm not even going to attempt to do and in that case I may as well just rebuild it in Unreal Engine (which someone has already done with various environments afaik). The way the fresnel works is actually based on the hue and value of the image. Desaturated/grey tones receive the most reflection. It's not actually receiving any depth information so there are some spacial inaccuracies (as you get with screenspace reflections), but it's not too bad overall. I will worry about masking the UI if necessary when I have built new graphics. I've decided I will probably do the buttons in matte black with white or grey highlights if possible. As it is, the UI is currently being blended with the shaders but I've kept it muted enough that they still function just fine. It's necessary to get the basic shaders built before I move on with the textures, as the function of the shaders dictates things like how bright graphics must be before they receive bloom or how saturated/which hue they are determines which is affected by fresnel, etc. This looks so badass. Keep up the awesome work, dude! One of the things that's bugging me about the Community HD that you can see in the screens above is the manual shading on the tiles. How they manually shaded to a direction is completely incorrect procedure for texturing and you see it a lot in amateur textures as well as professional. The way the brain works with images, it can essentially be tricked by shading to depth instead. This means that (like the Doom engine) the farther surfaces are from the viewer, the less likely they are to direct light toward the eye of the viewer. This is how we perceive light in low-light situations, especially if the viewer is projecting the light source with a torch/etc. Now, we can know that the models are going to be lit from whatever direction the engine specifies, so it would be possible to know the direction of the light source and build new UV maps to make the textures accurate, but it's a lot easier to just assume light is approaching the surface from every angle, or just the viewer's position. In that case, the surfaces which should be projecting towards the viewer, such as the up-facing portion of the floor tile rather than the portion which descends toward the grouting, will be the lightest. Depending on the bevel of the corners, the edges between the surfaces will generally be brighter if they are facing the viewer, and so we should actually highlight the edges. From there, we can shade the side-facing surfaces so they grow dimmer toward the grouting, with the most shadow gathering at the deepest point of the tile. As an example, here is a texture I made recently for a similar Doom UHD experiment for the plain wall texture in E1-M1. The wall is a flat 2-dimensional plane. 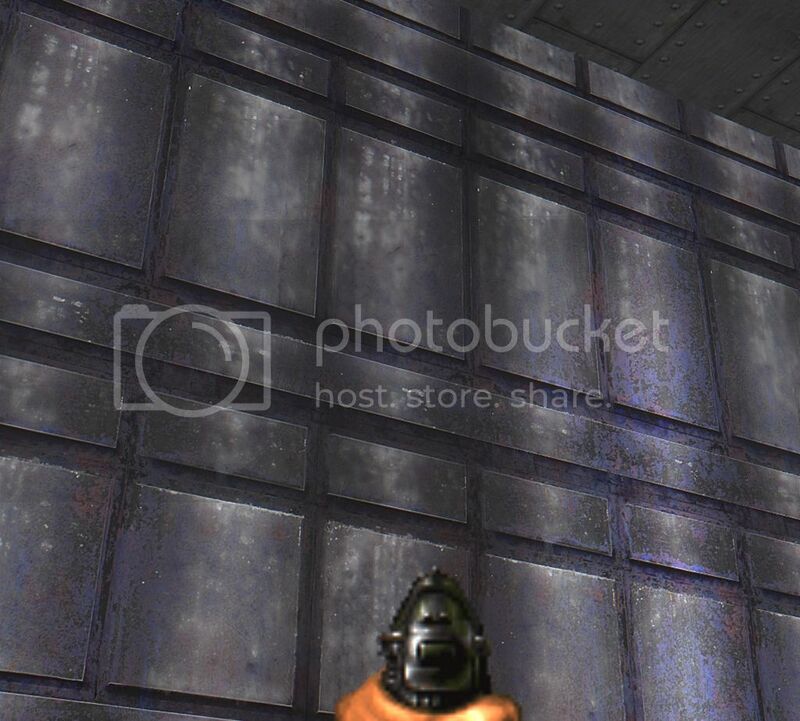 I may also continue that project soon, although I believe the Doomsday Engine aka Jdoom may actually support normal mapping/etc in future versions, in which case I'd rather not waste my time building these from scratch - normal maps require a high-poly source and are very difficult to build by hand. I literally gasped when I looked at that improved temple. The work you've done so far is incredible. The Reshade pictures look off to me, but I can't put my finger on what. 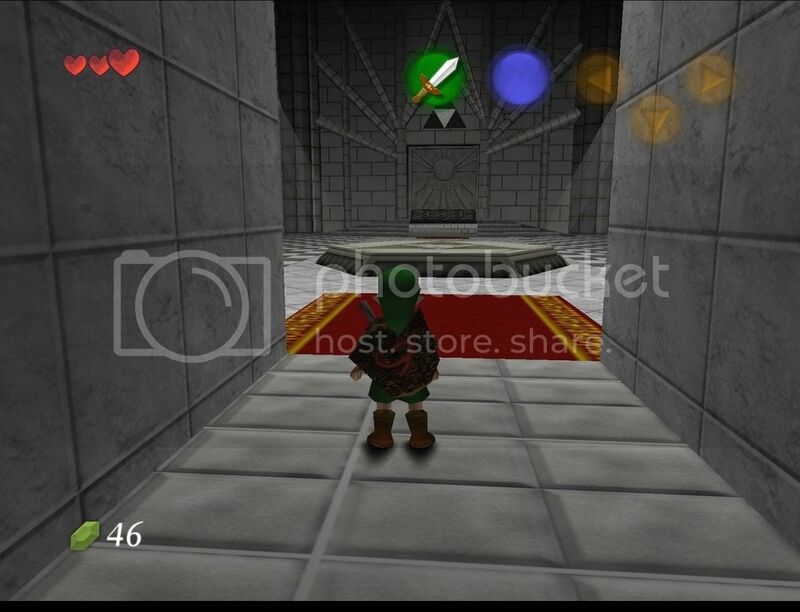 Think it might be the blurring in the Kokiri pictures, while the Temple screenshot looks blue. ^ It's a WIP, so anything in the Kokiri screens is actually completely outdated already - especially as I've changed the color curves and the DoF was not fully implemented at that time. The shader currently does shift the palette toward blue in the shadows, although that is intended. I have not changed it much since the last screens posted as I've been working at overhauling my living space IRL. Please do be aware that the final product regarding shaders and ROM patch is just being built to my taste, unlike the textures, and is not necessarily intended for anyone else. Running the full version of the shaders in 4k will likely require a GTX 1080 graphics card minimum due to the nature of frame drops actually affecting the sound pipeline on an emulator, although I will eventually optimise it for performance. Final version will have hotkeys to disable effects, anyway. That said, the colorshift is tied into the luminosity and is configured to offset for Bloom and lighting effects, so it may not really be worthwhile without adjusting the bloom as well. We'll see how I go on it. The colorshift and luminosity has already been adjusted heavily as 0.0.1 was only built in the kokiri forest and I have since adjusted it to account somewhat for other areas. If I want to change colors heavily, etc, I would be better off doing that in-engine where feasible, for instance I will likely be changing the color of the sky/fog in the kokiri forest in the ROM patch.